“The task before Mitt Romney as he accepts his party’s presidential nomination” tonight in Tampa “is to convince the narrow segment of remaining undecided voters to boot President Obama from office, and then, decide on Romney as a suitable alternative,” wrote NBC News political reporter Michael O’Brien on Tuesday. Indeed, the question foremost in the minds of voters as the GOP nominee takes the stage at the Republican National Convention likely will be: What kind of president would Romney make? While the Republican platform and Romney’s policy positions and campaign promises provide a good point of departure for inferring many of the specifics of a prospective Romney administration, they do not provide a comprehensive basis for anticipating the more intangible aspects of a Romney presidency. Fortunately, political psychology provides the tools for answering those more elusive questions. Leaders fitting this profile are characteristically prudent, proper, dignified, dependable and more principled than other leadership types. Highly organized, with a strong work ethic and careful attention to detail, this presidential style is the epitome of competence in crafting public policy and a deliberative approach to problem solving in the Oval Office. Conscientious leaders commonly keep themselves thoroughly informed, exhibit depth of comprehension, are able to visualize alternatives and weigh the implications and long-term consequences of their decisions, and are cautious in their actions. With Romney at the helm, history is unlikely to repeat itself with a foreign policy fiasco such as the futile hunt for weapons of mass destruction in Iraq that marred the presidency of George W. Bush. But personality can be a double-edged sword. On the downside, conscientious leaders such as Romney, who thrive in a corporate setting, may flounder in a political environment where executive power is constrained by divided government. This happens because the political Achilles’ heel of highly conscientious leaders is a stiff, wooden demeanor and an inherent difficulty in conveying a likable persona. In other words, they lack the retail political skills required to consummate their policy objectives. Motivation for leading. Conscientious leaders tend to be guided by pragmatism rather than ideology. They tend to centralize power in the executive branch as a way of preventing matters from spinning out of control. Because of their structured, somewhat pedestrian cognitive style, they are wary of new or untested ideas, which makes them averse to ideologically driven proposals and more inclined to a pragmatic approach to politics. Investment in job performance. Because of their strong work ethic, attention to detail, and managerial competence, the leadership style of conscientious leaders pivots around the need for productivity in the form of policy implementation. Staff management strategy. Predominantly conscientious leaders are more predisposed to act as strong advocates for their proposals than to seek consensus. Information management strategy. Given conscientious leaders’ penchant for overcontrol, orderliness and perfection, they are likely to exhibit a high degree of involvement in managing information as a way of protecting themselves from potential error. At the same time, their respect for order and hierarchy tends to find expression in a preference for obtaining information internally from administration officials and advisers rather than from independent sources, resulting in a relatively closed decision-making process. Media and public relations. Because of their strong sense of duty, conscientious leaders are likely to behave in a reasonably open, relatively cooperative manner with the media, though in a somewhat distant, formal manner. Conscientious leaders derive little satisfaction from relating to the public, which leads them to delegate this aspect of governing to proxies and senior officials, who are likely to play a prominent role in articulating and defending policies. The bottom line is that political psychology cannot tell us whether a President Romney would go to war with Iran, but understanding his personal psychology offers voters a glimpse into how he might make that determination should the occasion arise, and how he would make the case for war to America. This is the opinion of Aubrey Immelman, a political psychologist who specializes in the psychological assessment of presidential candidates. 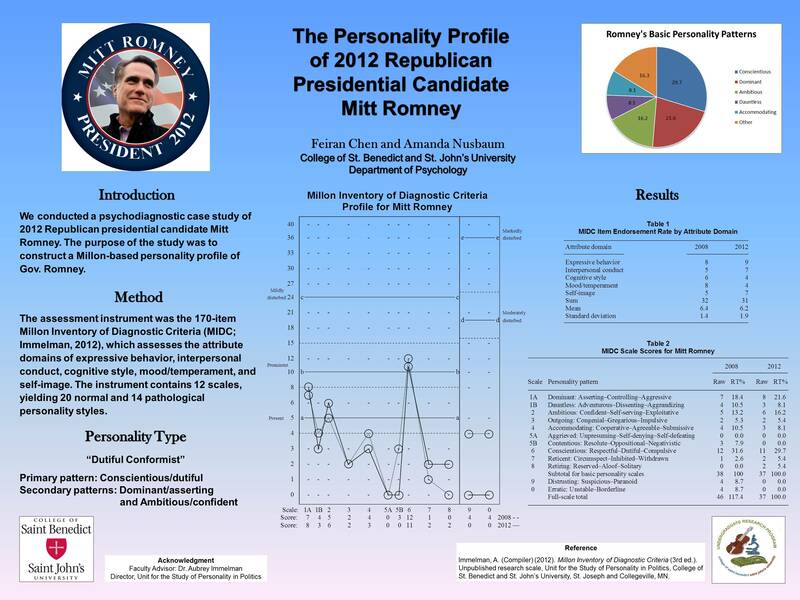 His analysis is adapted from a paper presented earlier this summer in Chicago at the annual scientific meeting of the International Society of Political Psychology. He also was a candidate in the Republican primary for the U.S. House 6th District race.